Guns N' Roses - Collection (1987-2004) (LOSSLESS) | Free eBooks Download - EBOOKEE! Posted on 2014-02-18, by interestinglike. 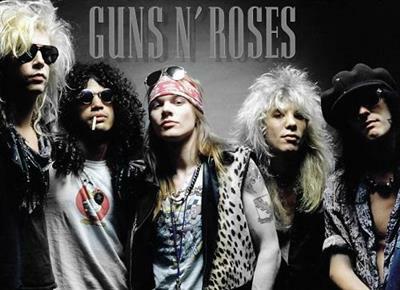 Guns N' Roses is an American hard rock band that formed in Los Angeles, California, in 1985. The classic lineup as signed to Geffen Records in 1986 consisted of vocalist Axl Rose, lead guitarist Slash, rhythm guitarist Izzy Stradlin, bassist Duff McKagan, and drummer Steven Adler. Today, Axl Rose is the only remaining original member, in a lineup that comprises Use Your Illusion-era keyboardist Dizzy Reed, lead guitarists DJ Ashba and Ron "Bumblefoot" Thal, rhythm guitarist Richard Fortus, bassist Tommy Stinson, drummer Frank Ferrer, and keyboardist Chris Pitman. The band has released six studio albums to date, accumulating sales of more than 100 million records worldwide, including shipments of 45 million in the United States, making them one of the world's best-selling bands of all time.
? Tracks 1-2 mixed in (Ou)R Sound.
? Track 3 recorded live in Las Vegas, January 25 1992.
? Track 4 recorded live at The Marquee, London, June 28 1987.
? Original versions of 'Yesterdays' and 'Knockin' On Heaven's Door' from the album 'Use Your Illusion II'.
? 'November Rain' from the album 'Use Your Illusion I'. No comments for "Guns N' Roses - Collection (1987-2004) (LOSSLESS)".